Are you ready for Easter?!?! I am so ready. I have lots of Easter-y stuff around to make a super, super cute Easter basket for Autumn. I had been hitting up the Target Dollar Spot and the local Dollar Tree to get lots of fun random things to include in her Easter Basket. Which might actutally be a bag, but you get the point. Lots of stickers, some barrettes, crayons, mini board books, and a flipping toy chick. And the ‘big’ toy is a pair of Doc McStuffin’s light up clogs. They are way too big but are super cute. I couldn’t resist because she loves to play dress up at daycare so, so much. Plus, I picked up a bunch of eggs to dye with her this weekend. I’m sure it will be just one big mess but I think it will be a fun experience. We painted some plaster eggs over the weekend and that was a great activity. Granted, she tried to crack them at first as we cracks the eggs for me when I make something. But once I explained they aren’t eggs to crack she got the point and got to painting. I’m going to have to keep those half painted eggs forever. So cute!! Those eggs will last forever, but these Easter Chicks Cupcakes won’t! These Easter Chicks Cupcakes are really Chocolate Brownie Cupcakes with some Green Vanilla Buttercream Frosting topped off with some green coconut ‘grass’ and Peeps chicks. But Easter Chicks Cupcakes sounds cuter. I used a chocolate brownie cupcake base as I wanted the cupcake to look like the earth. The green frosting is the glue for the green coconut grass. And then the marshmallow Peep Chick finishes it off. I used the traditional yellow Peeps Chicks but the Peeps Bunnies are just as cute. I brought these cupcakes to daycare and the kids loved them. Preheat your oven to 350 degrees. Line your muffin pans with paper liners. Melt the chocolate and butter together in a double boiler. Set aside to slightly cool. In a large bowl, beat the eggs. Add the brown sugar and beat until incorporated. Add the vanilla extract. Add the flour to the brownie batter and mix until just combined. Evenly divide the brownie cupcake batter between the 24 liners. Make for 25-30 minutes, or until the cupcakes are firm to the touch while the center is still moist. While the cupcakes bake, make the ‘grass’. Put the coconut into a small bowl. Add about 10 drops of green food coloring and mix to color all of the coconut. Make the frosting by beating the room temperature butter until it is light and fluffy. Slowly add the powdered sugar and beat on slow speed until just together. Add the vanilla extract, milk, and enough food coloring to achieve a rich green color. Once your cupcakes have baked and cooled, frost the cupcakes with just a bit of frosting. You want it to be a pretty thin amount over the whole cupcake. 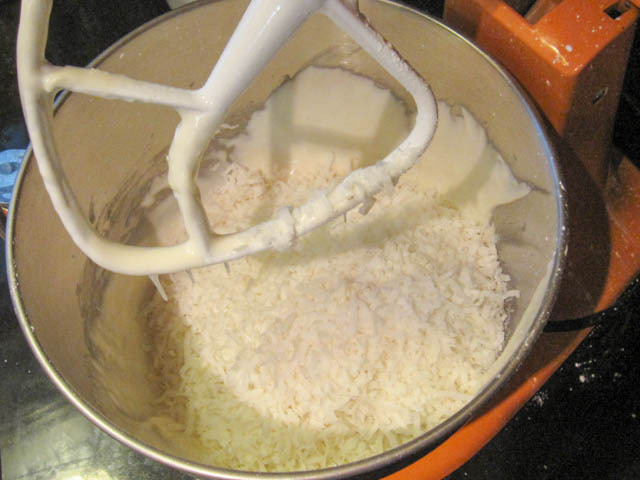 Sprinkle the dyed coconut on the frosting. Insert a toothpick into the bottom of the Peep and then push the toothpicked Peep into the cupcake. I’ve been looking forward to Friday all week!! Sure, it means it’s the end of the work week but what it really meant is that I got to share this recipe for German’s Chocolate Pie. Soo yummy! Price’s birthday is Monday so I made this pie in honor of that as German’s Chocolate Cake is one of his favorites. I made him a German’s Chocolate Cake (< pardon the old photos!) for his birthday before so I wanted to do that again, but with a twist! We both loved this pie! It’s such a good combination of chocolate, coconut, and pecans- all elements in German’s Chocolate Cake’s super rich condensed milk based frosting. The pie basically uses the same ingredients as the cake but with a twist. When I was making this I was thinking it would be pretty dense from the sweetened condensed milk but it ended up being pretty light and fluffy, which is from beating the eggs very well when they are incorporated into the chocolate and butter. It still was really rich but the light texture helped make it feel a little less indulgent. Anyway, since it’s almost Price’s birthday we are celebrating it this weekend. We always try to do something big and fun for birthdays so we have a trip planned. There has been plenty of research related to all the good things we can eat and things we can see. At least there will be plenty of walking to help work off all the BBQ! Removed from the heat, and add the sweetened condensed milk end eggs mix well to fully incorporate. Add the sugar, coconut, and pecans. Stir until blended. Set pie on a cookie sheet and bake for 30 -40 minutes, or until the center is set while slightly shaken. Yay! Today is Memorial Day! We are sticking home today to hang out, cross some things off the to do list, and grill. We made steak last night so I think some hot dogs for lunch and chicken for dinner. Autumn even had her own piece of steak (not seasoned, well done) that she sucked on and then dropped for the dog. I swear I try to grab what she is about to do but she is sneaky. And when she isn’t dropping him food she hangs a hand over the edge for him to lick. Those two are going to be trouble as she grows up. It’s going to be too cute! And a bit awful!! Anyway, we did some crafty stuff for our room yesterday and we’re going to do some stuff for her room today. I have most of the elements together for a gallery wall for her so I am going to put it up while mapping out some place holders for the 2 little canvases I am going to order. I just love to be able to create something new for our house. I only wish we did it more often. Anyway, May has sped by and it’s now time for this month’s Secret Recipe Club post I was given the blog Sew You Think You Can Cook. 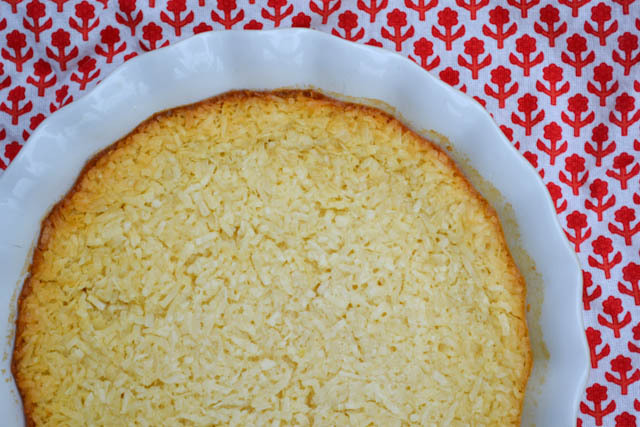 Lauren shares recipes on her blog that she makes when she is not busy with quilting scrapbooking, and cross stitch. When she is not cooking and crafting she is an aerospace engineer… hello smarty! Sounds like a cool profession says the person who pulls out a calculator to figure out a tip. ha! 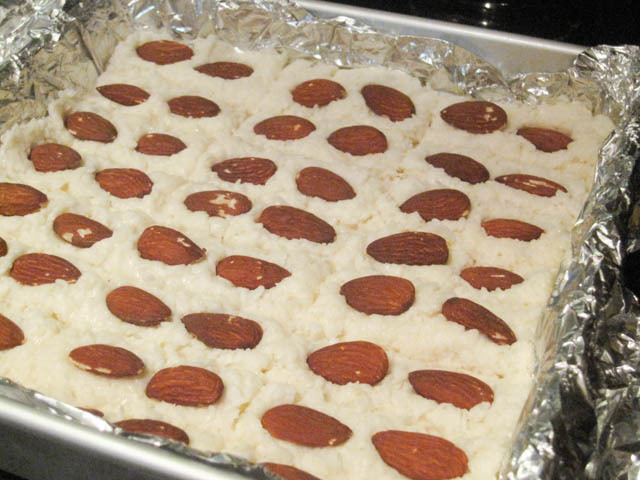 While I was eyeing a few of her savory recipes, like the Vineyard Chicken, her homemade Almond Joy bars jumped out to me. I hadn’t made candy in the awhile and never a candy bar like this. I was up for the little challenge! 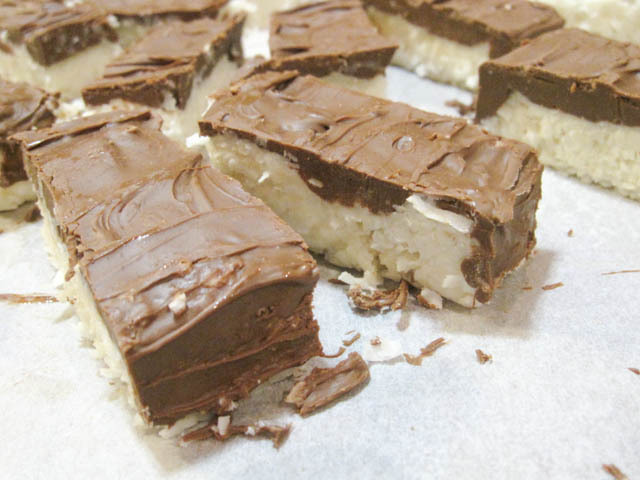 I really suggest using a stand mixer to make these Almond Joy’s. The mixture is sticky and would require a bit of muscle so I think it’s best to use the stand mixer so you knew you evenly mixed everything together. If you need a workout then be sure to just a greased bowl and a wooden spoon. Assembling the bars is a breeze. The trickest part is the chocolate part. I never have much luck coating candy evenly, and neither did Lauren, so I decided just to coat the tops. If you are a pro at coating candy then feel free to do that instead, you’ll just need more chocolate. So a big thanks to Lauren for such a wonderful recipe. As well, a very special thanks on this Memorial Day to her and her husband, who is in the Air Force!!! Line an 8″ x 8″ baking pan with aluminum foil. Then spray the lined pan with cooking spray. 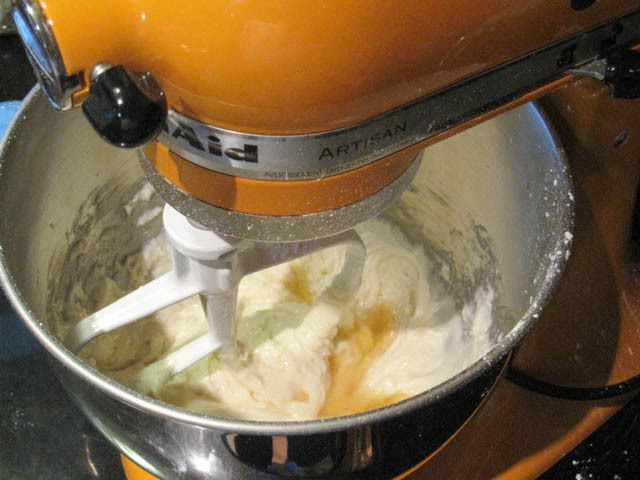 In the bowl of a stand mixer, pour the condensed milk and half of the sugar. Using the paddle attachment, beat until combined. Then add the remaining sugar and beat. Add in the vanilla extract and salt then beat for another minute until really whipped. 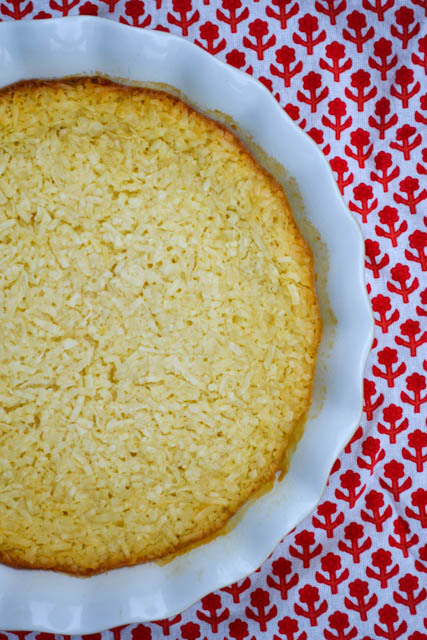 Using greased hands, press the coconut mixture into an even layer in the lined baking pan. 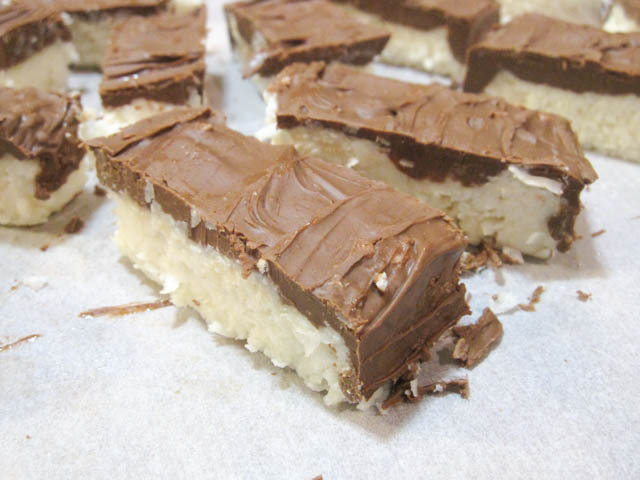 Score the candy bars by dividing the pan in 3 pieces in one direction. Then rotate the pan and score it into 8 equal pieces in that direction. Place 2 almonds onto each candy bar. While the bars are still in the pan, completely cut through where you had previously scored the candy bars. Melt the chocolate and then evenly pour it over the bars. Let cool complete prior to removing the liner from the pan. Gently flip the candy over onto a cutting board. Cut out each candy bar by cutting through the chocolate at each location where you had cut through the candy previously. We have so much to do but it should be fun to enjoy the weekend and get a bunch of stuff done. Fingers cross on us actually tackling the to do list. Plus, it’s going to be nice weather. Well, it might rain Saturday but it’s supposed to be warm so I can work with that. But Sunday is supposed to be even better. Also, it’s my first Mother’s Day, so that should be fun. Price has agreed to help Autumn whip up breakfast for Mother’s Day while we lounge around in the morning. She was babbling to him that it might be hard to make waffles considering she can’t yet sit up, so he agreed to do the heavy lifting, but as long as she watched to learn how to make on of my favorite breakfast treats. Every week I ask Price what pie I should make for my weekly pie post. Sometimes I offer him a few choices between things and other times he comes up with the idea completely. This week I threw some ideas at him, he veto’d them (for now), did some googling and found this pie. And this is how this pie came to be. It reminds me of a mega coconut macaroon. It’s sweet, custardy, and very coconuty. I enjoyed it just like that but I think a chocolate drizzle would be amazing on it as well. Preheat oven to 325 degrees. Generously grease and flour a 9 inch pie plate. In a medium bowl, mix together sugar, flour, and salt. Stir in melted butter and vanilla extract. Add the eggs one at a time, mixing well after each addition. 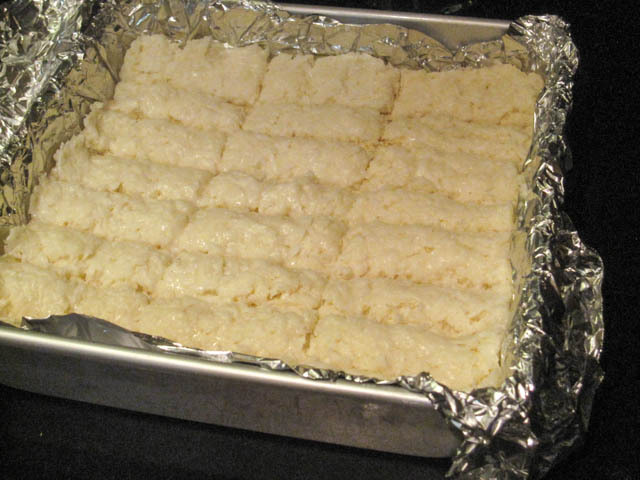 Mix in evaporated milk followed by the shredded coconut.